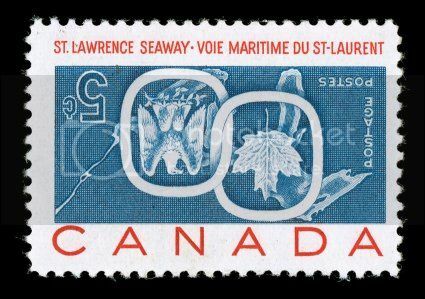 The St. Lawrence Seaway stamp of 1959 with Inverted Center, Scott #387a, is by far the most famous of these. Having been “the First” it will always remain the collectors’ favorite … the most famous Canadian Error. The first report of the discovery of the Seaway Inverts was when a young office boy from the Marlborough Hotel in Winnipeg purchased 30 stamps from a Post Office outlet in the Eaton’s store on August 20, 1959. Kas Bileski told me he purchased 26 of those in early September of 1959 from the office employees for $1,000 each. In Charles Verge’s article in Scott Stamp Monthly, April 2003, he reported that those other four were used on letters mailed by Mildred Mason, the lady responsible for the mail at the Marlborough Hotel on that same day. The other 20 copies from the Winnipeg sheet had been sold through the Eaton’s Post Office and apparently all used on mail. Covers that exist attest to this. The known covers bearing the Seaway Invert Errors are the main topic of this article. This was the beginning of the story that led to national news reports and the Post Office Department scurried to track down other error sheets still in Post Office stocks. Kas Bileski even appeared on national television “Front Page Challenge”, the very popular current events quiz show at the time, and “stumped the panel” with the story of the find. Charles Verge goes on to report that, on September 11, 1959, a pane of 50 was found in the postal stocks at the Winnipeg Post Office and a postal clerk in Peterborough Ontario found another pane of 50. Both were sent back to Ottawa. Inverts also were found in Picton, Ontario. Charles Verge states that 25 from that sheet were used on mail from the Bank of Nova Scotia on August 10, 1959. Proof is shown by the first cover in the listing below, which is cancelled August 10, 1959. This is the earliest recorded cover bearing one of these great errors. Charles says that the discoverer kept two copies and gave a third to a friend. The remaining 22 were sold through Jim Sissons of Toronto to Kasimir Bileski for the then princely sum of $21,250. Charles reports that the lot included a copy used on card and a damaged copy used on cover. Covers are also known from Ottawa, Smith Falls and Southampton, all in Ontario. The one used on cover from Montreal on September 8, 1959 addressed to Miss Gladys Allen is almost certainly from the Winnipeg finds as there is a cover mailed on August 25, 1959 to Miss Iris Allen in Swan River from Winnipeg. The names and the handwriting on the two covers are far too similar to be coincidence. Someone must have taken one of the stamps with them on a trip to Montreal and mailed a card back out West. Some years ago an ex-post office employee had a block of 10 Seaway Inverts for sale. This reportedly was from a 3rd sheet found in Winnipeg. It was quietly put away and only sold many years later. The owner was selling one or two stamps from his sheet each year, through Harmer’s auctions in New York, to pay for his summer vacations. Charles Verge also gave details of a pane of 50 found in Joliette, Quebec. Rolland Perreault told this story to Montreal, Quebec philatelic writer, Larry McInnis. Three had already been used on mail. Seventeen had been stuck on window envelopes before the discovery and were sold to stamp dealer Herman Herst. Of the 30 left over 10 were sold in New York. The remaining 20 were sold to Bileski for $11,900 … about the price of an average “single” today.